The first few major appointments we made for PAX East 2012 were with 2K games. They had a massive presence on the convention floor, but we were most interested in two of their offerings, Civilization V: Gods and Kings and Borderlands 2. Fortunately, we were lucky enough to score a demo of each, then met with a developer to discuss what it was that we’d seen. Our first stop was the Civ V booth, where we were ushered in to a lavishly decorated renaissance-style room with, frankly, the most comfortable seats at the entire convention. For those who don’t know, Civilization V has had its share of DLC, but Gods and Kings is an honest to goodness Expansion Pack. 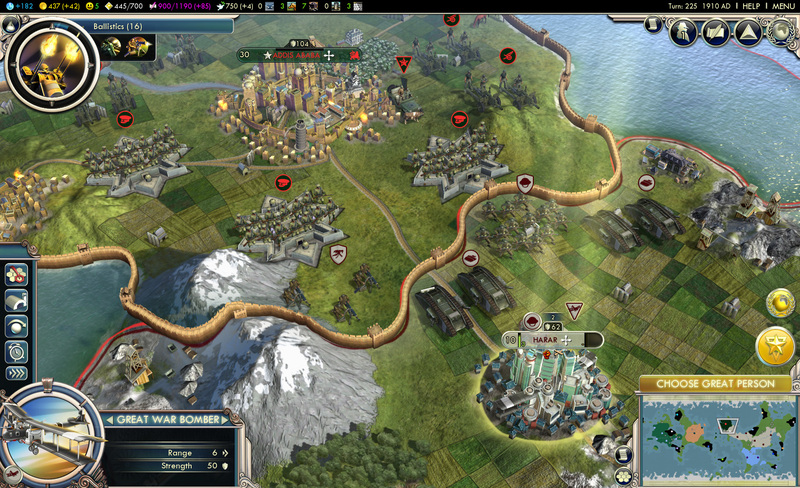 We aren’t talking about one or two new Civilizations, but 9 of them, with more than a dozen new units. In our demo, we were treated to conflicts between Attila the Hun, Maria Theresa of Austria, and Haile Selassie of Ethiopia. Other new civilizations include Carthage, Byzantium, and the Netherlands. As is to be expected, each has their own unique benefits, some of which can lead to some very interesting changes in gameplay. For instance, Ethiopia gets a 20% advantage in any conflict against a larger civilization, meaning the instant you push their borders back far enough, they gain the ability to push back that much harder. Carthage gets elephant units, and has the ability to move them over mountains, so presumably anyone trying to put together a Roman empire should watch their backs. New units added with this expansion make for some nice alterations to gameplay as well. One, for instance, is the melee ship, which is able to attack port cities, which previously only had to worry about land attacks. Archery isn’t the end all be all of ranged units anymore, either. There is little doubt, though, that the real meat and potatoes of this expansion is the addition of religion and espionage. There's something so empowering about picking a religious icon. Religion is being added as a major midgame factor. It begins with a resource called faith, gathered in a number of ways, ranging from building temples to finding artifacts. When a civilization earns enough faith, they get to pick a pantheon. Each pantheon (and thus each associated benefit) can only be selected once, so the early game is essentially a race to the appropriate faith level in order to have your pick. 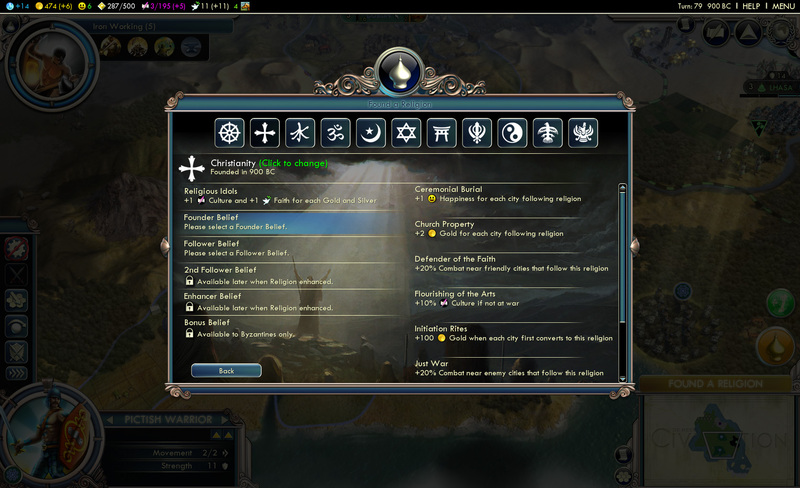 Once you’ve selected one, you must continue to accumulate faith until a prophet is born in your civilization, thus granting you a full religion, which is when the core of the religious aspect of gameplay can begin. You are able to pick an Icon, essentially just an arbitrary symbol of your belief, from a list of religious symbols based on both classic and modern religions. Then you select a Pantheon Belief, a Founder Belief, and a Follower Belief, each with its own benefits. Once established, religions begin to spread. Any city within a certain radius of your holy city will have a certain amount of religious pressure to convert. This allows your religion to spread beyond your borders. As you might imagine, different competing religions within a region can cause tension and strain relationships, just like in real life. As the game rolls further into the modern era, religion becomes less of a factor as territories become more rigidly defined and expansion slows. Fortunately, Espionage steps up to make things more interesting. 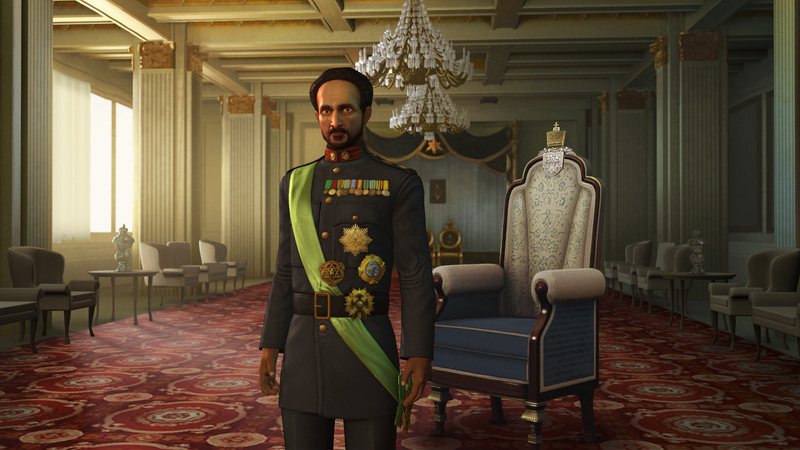 Reintroduced from Civilization IV, Espionage has had a major overhaul. For one, the number of spies is now limited, based on the number of eras you’ve progressed through. This is useful to keep players from spamming the map with spies. Once you gain one, and train him to an adequate level, a spy has a number of uses. One is the theft of technology. Another is an intriguing game mechanic called… intrigue. You can place a spy in a territory to gain intelligence about the actions and plans of that region. A novice spy might just be able to tell you that a rivalry has begun, or that an army is being built. A more experienced spy can go so far as to tell you the specific city an attack will target. And this info isn’t fluff, it is actual insight into the AI’s decision process. In addition to their information gathering skills, spies can take a more active role in shaping the political landscape. A rigged election, for instance, will gain you some influence in that city, while a full-scale coup will actually swap your influence position with the current leader. Be careful, though, a botched coup could lead to a dead spy, and then you need to start over with a fresh recruit. I'm coming for you, Ethiopia! There are a handful of other tweaks to gameplay, such as the addition of religious city states, which earn faith, and mercantile city states, which generate porcelain and jewelry. Most of the other changes, though, were made with balance in mind. After the demo we spoke to a game designer who explained that no amount of play testing is ever enough to completely defeat an ingenious Civilization player’s constant search for exploits, but one of the goals of this expansion has been to close some of the more glaring ones. One such exploit they eliminated was the so-called “Economic Victory” which resulted from the disproportionate effect gold had on diplomacy, essentially allowing you to buy your way to a win. Now diplomacy is mostly earned through quests-like tasks, such as a global race to see who can get the most culture, or a challenge to produce a great scientist. There were a few refreshing discoveries made in our chat with the developer as well, such as the fact that they decided to make a full expansion rather than another sequence of DLCs because the Civilization fanbase has largely been with the series for a very long time, IE since before DLCs became the defacto way of adding content. Thus, a full expansion is something that has long been craved by many, so they felt that the time had come to satisfy the old school players. Another plus is that the original development team produced this expansion, thus eliminating the flawed implementations that tend to result from a new team being brought in to work on an unfamiliar game engine. It is particularly good to know that this team is back, because it brings with it designers so deeply steeped in strategy gameplay that they even have published board games under their belts. All in all it gave us a great feeling about the future of the title. 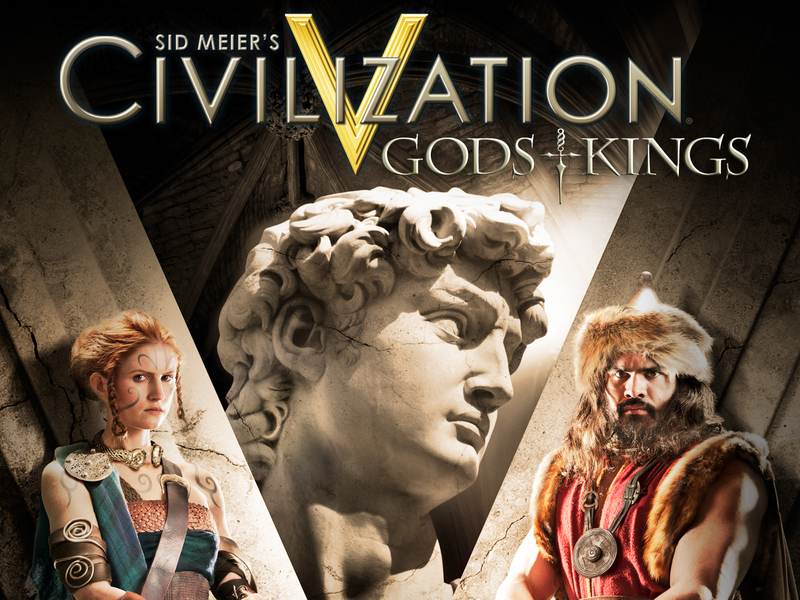 Civilization V: Gods and Kings is due out June 19th in the US and June 22nd Internationally, with a retail price of $29.99.